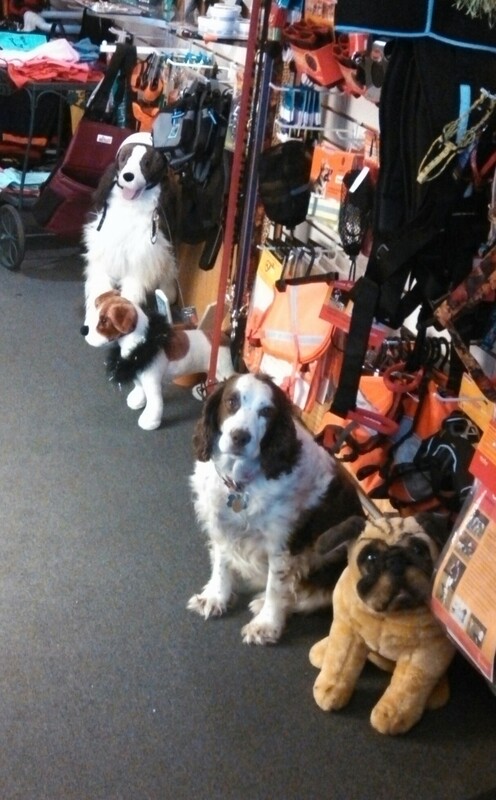 Can you pick out the real dog? One of my frequent stops is always Sophie’s Dog Bakery at 10554 Main St., Hayward, Wisconsin 54843. Canine Cookies that look good enough for humans! This boutique pet store has everything you could ever want for your dog or cat, including a spectacular display of dog treats. 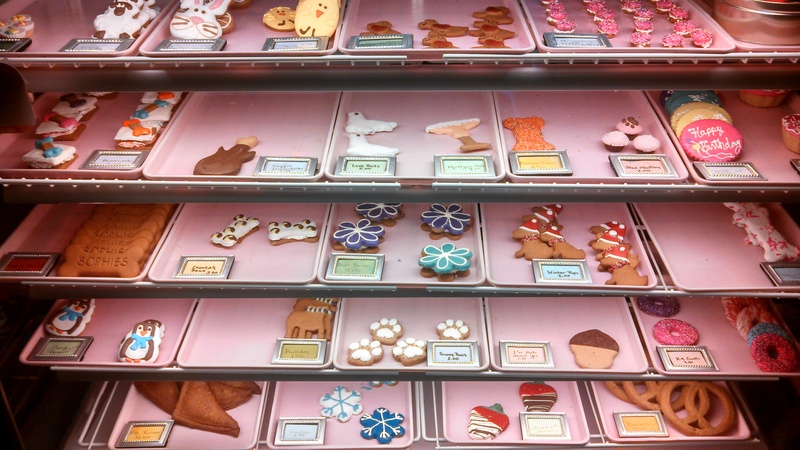 The delightfully decorated dog cookies look good enough for humans to eat, so much so that owner, Jan Beatty, decided to also offer some tasty gourmet people cookies just to satisfy her shoppers-no, they are not in with the dog cookies, but look for them on the counter. 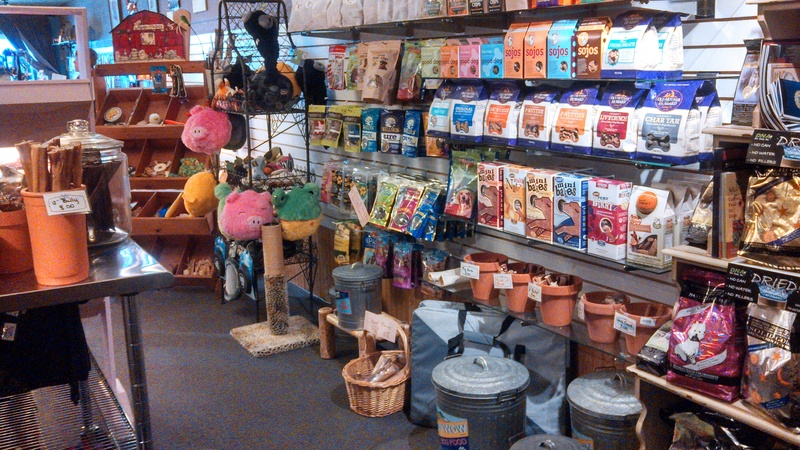 Extensive array of supplies for your beloved pet! The array of colorful collars, leashes and pet clothing is dazzling and they offer an extensive line of both traditional and ‘green/holistic’ pet grooming and care supplies. If you don’t see what you want, ask Jan or Linnea, they can usually get it for you if they don’t already have it! Many people are not even aware of the other part of this wonderful store – Sophie’s also carries splendid women’s things. Unique jewelry, fine clothing, and a display of hats that will dazzle your senses. I love the beautiful wraps and scarves they carry and they have a new line of women’s sleepwear that I want; the material is so soft. There is also an eclectic lineup of makeup, clutches, and other accessories sure to please your tastes. People always comment on the exquisite bracelets I find at Sophie’s-I’ll post some pictures here as soon as I find them! Visit their Facebook page for up-to-date information on their fun events, and new products. Oh…did I mention they offer a pet-sitting service for a small fee? This comes in handy if you need to leave your dog for a short time to do some more shopping! Stop at Sophie’s Dog Bakery next time you are in Hayward, browse through their artfully decorated store – you will be amazed at what you find! This entry was posted in NORTHWOODS LIFE, Shopping and tagged cathy lareau, Dog Supplies Hayward, Jewelry in Hayward WI, pet supplies hayward, Shopping in Hayward wi, Sophie's Dog Bakery Hayward wi, Women's fine clothing Hayward. Bookmark the permalink.